Jerusalem - President Donald Trump’s pro-Israel positions have not garnered him support from American Jewish voters, according to a new survey. 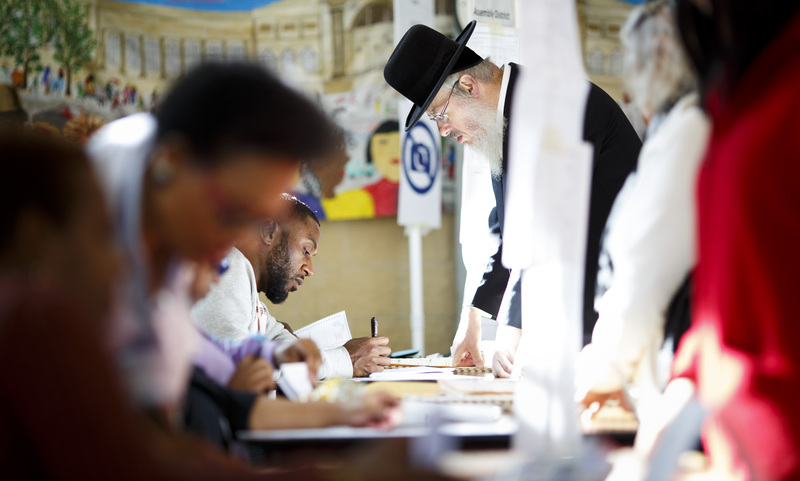 The poll found that 74 percent of Jews planned to vote for Democratic candidates in November’s midterm elections. The figure corresponds with similar voting patterns in past elections. Overall, 75 percent of American Jews disapproved of the president’s policies, particularly on domestic issues such as immigration, taxes and health care. The survey was conducted by the Mellman Group, a U.S. polling agency, for the nonpartisan Jewish Electorate Institute. It surveyed 800 American Jewish voters from a variety of backgrounds and geographic areas and had a margin of error of 3.5 percentage points. Trump’s foreign policy fared no better, with widespread criticism of the president’s handling of anti-Semitism, the Iranian nuclear deal and his moving of the U.S. Embassy to Jerusalem. The embassy move, in contrast, has been warmly welcomed in Israel. While a slim majority approved of Trump’s warm relations with Israel, only 6 percent said this will cause them to consider supporting him or a Republican candidate. Over 60 percent disapproved of how Trump has dealt with the Palestinians. The Palestinians severed ties with the U.S. after Trump recognized Jerusalem as Israel’s capital last December. Since then, the U.S. has cut hundreds of millions of dollars of support for the Palestinians. Although 92 percent of American Jews identified as “pro-Israel,” 59 percent said they find fault with at least some of the Israeli government’s policies. Prime Minister Benjamin Netanyahu has forged a close bond with Trump, deepening a rift with the mostly liberal Jewish American community. The survey confirms Jewish voters’ entrenched loyalty to the Democratic party, “negative assessments” of Trump and show that they “prioritize domestic issues in deciding which candidate to support,” the poll’s authors said. no difference his stance on Israel right now. Fake News. There is no way that only 74" of Jews will vote Democrat. Even if lets just say 6% will vote independent the remaining 20% will vote Republican??? No Way. Historically Jews voted Democrat between 85 - 90% and that is before the Republicans openly talk about Deportations, Separating Families. There are many pictures with Children in Cages. Metal Cages. No Jew can vote for this. There is not a single Jewish Republican Senator or Congressman. Why is that? Just why? There are 36 Jewish Democrats in Congress. 36 : 0 It says all. Liberal Jews have all College Education. That group (Even Goyim) all vote Democrat. Orthodox Jews are mostly on Welfare,Medicare etc due their Large Families K"Y they all vote Democrat. Republicans are trying to take away Medicaid,Medicare Soc Sec etc. 75% of Jews disapproved Trump. I sure hope he doesnt read this. Rachmone Litzlon if he does. First find out it they are really Jewish before asking their opinion. It just goes to show, no matter how smart we Yidden think we are, 74% will vote for the liberal, socialist, democrat gonif. Makes no difference, it could be the donkey who is running for office and the Jews would vote for it. AMAZING! support illegal immigration, that momzer FDR was responsible for the deaths of millions Yidden, but yet you want open boarders. I wonder what you liberals will say when the Dems & stupid self deprecating communist Jew Bernie Sanders & his crew have their redistribution of wealth plan enacted. You will scream like a stuck CHOZER. I want to see what you say when they start redistributing your wealth to the lazy schvartzes, it won't be a "Goldene Medina" any more, just like South Africa! Those guys screaming jews will not replace us are firnges just like Fraakain and Rev wright. The reason jews won't support him is because they are not torah jews. Their form of judiasm is fake Judaism. Trump won 85% of frum jewish votes. He has our strongest support and he is an ohev yisroel. He let Rubashkin out for no reason other than his love for jews and he is proud of his jewish daughter. Re your next lies Maga means bring America back to the day when small towns flourished with jobs and family life was strong. That's Maga. Enough of your stupidty. FAKE NEWS! This is a reform based survey. The reform movement have 0- zero percent Jewish grandchildren, zero affiliation to the Jewish religion. They are all liberal leftists, whom President Trump and PM Netanyahu have shunned and discounted them completely. Rev Avigdor Miller, OB"M said "one may not vote for a Democrat, as they are liberal leftists that despise the Torah commandments. It shldnt. Jews are loyal citizens to the USA. We have no dual loyalties. Don't forget, many jews professed to vote democrat ,but at the poling booth where no one can see they became republicans. "He let Rubashkin out "
Asinine remark! the guy was a criminal and a thief. he got more than he deserved? so, that's a reason that Jews should support Trump? Bist meshuga? They didn't ask me or anyone I know. What in the world is the Jewish electoral institute? Who runs it? What Is its purpose? Sounds like money could be put to better use. Explain how being a pro-nazi racist, not paying taxes, loving bloody tyrants, separating families for deportation is following the Torah commandments. Many frum Jews won't vote for rasha trumpf's alt-GOP. Secular and zionist Jews who are USA patriots, not sheep will vote their conscience and rid the world of this Haaman narcissist reality tv imbecile. yes, antisemitism is on a rise. just read VOZ heder mamzer. “ no difference his stance on Israel right now. "Jews need to vote" DEMOCRAT for the sake of the TORAH and the Yiden. The Torah clear about Immigrants. Woahavtem et Hager. Woohavto et Reacho. Love Your Brother Legal Citizen or Not. This is the main reason why Yiden vote Democrat. Nice try belittling Jews. We are the most Educated Nation. BS. None of the Tzadikim voted at all. Not Republican or Democrat. I am afraid you mixing up your Rabbi with the NK. Respected Rabbis will never say things like that. Kol Yisroel Areivim Ze bozeh. FYI If a REFORM JEW does somethyng it reflects on YOU Ask your Rabbi for further explanation. That is so sad. We Jews are One. Whatever you said reflects on all of us. Sad but true! Why anyone would vote for people who support gay marriage, abortion & all the other Torah prohibitions is the question. And whatever the self deprecating liberal left wing Yidden say & do reflects upon us. Perhaps you are ok with your son marrying a man or your daughter marrying a woman. Im not. “ "He let Rubashkin out "
Wrong you rotten liar who will burn for saying such garbage on a fellow Jew . The man is a huge bal bitchon. He commited a small crime and was a victim of a witch hunt by vigilanties. Of course the stupid KGB like thugs know how to find 50 statutes that he violated . Once you dig you find . No criminal at all . You are the criminal . Shame shame on you ! Fake Torah you am haretz. Vahvatem es hager means Only Jews not goyim . No such mitzva to like goyim . And we were very good to our Russian brother immigrants ? Who taught you how to learn you gruba Am haretz ? You distort the Torah . Writing w in place of a v and a j in place of a y does not make you intelligent. You just come across as an obnoxious ferd. A small crime? 24 million is small? What wrong with you? Just say he should have been out after 3-4 years. “ Fake Torah you am haretz. But the Torah serves as a model of how nation states should behave towards the people residing in their midst. Isn’t it our job to be a light unto the nations? Yes. For a small crime in Republican Controlled Iowa the white christian jury put him in jail for 27 years. If this happens in Democrat controlled NYC NJ where many Judges are liberal reform jews on avg maybe 2-3 years. This is one more reason a Yid must vote Democrat. Can you even imagine if the Yiden in NY,NJ etc would have to live between the Christian right? It would be the end of Yidischkeit in the USA. It doesnt matter to us where the Embassy is what does matter the life , Yeshivot etc we have in these liberal cities. Can you name a single Yeshivah in Iowa,No Dakota,Louisiana,So Carolina,Wyoming,Mississipi, West Virginia Combined? In NY and New Jersey alone there are 100s of Yeshivot. Please name me 10 Yeshivot in the Entire USA which State voted for Trump. If you are talking about the REAL JEWS they all live in sanctuary liberal cities like NY, LA etc. Their vote automatically going for the Democrats no matter what. Every single yids vote in NY, NJ, Cal went for Hillary because their electorate voted for Hillary irrelevant what they actually voted for. We dont have the answers, only Hashem knows. You can ask? Why any Yid would vote for the same party that every Neo-Nazi - White Supermacist etc voted. All of them. They did not hide it. We cannot possible have the same interest. I personally much rather vote for someone who supports gay marriage than put the Nazis in power again. Hitler jm"s killed gays. Please just remember when you vote. The party who hates the gays hates the Yiden even more. Gypsys and gays were always been persecuted together with the Yiden. You dont have to agree with to join them to save our people. The best thing Trump ever did was manage to get snowflake libtards like you so obsessed with him, your lives have become filled with misery and hate! I’m loving it! Where do you get such stupid logic from. Of course we are all brothers even for frie Jews . But they don't represent us in govt and they nebach seek to destroy our values . Why would I vote for them ? I still have to be mechalal shabbos to save their lives but vote ? 1) There are just as many Muslims in the dems as Nazis in tne Repub right . It's such a small minority . It's minuscale . 2) Muslims are more dangerous . How many Jews in 2018 died from Muslims and how many from Nazis ? Such hatred on this site, and Loshon Hora, only a few weeks after Yom Kippur! It is almost impossible to have a civil discussion on this site,without name calling, character assassination, etc. Shame on the name callers, and the provocateurs on this site; nebech, it is a shanda to read these responses. But you are also an American, aren’t you? You and everybody else in this country is responsible to place a moral goverment in place. So while you may be right about the mitzvah you are still wrong to say that it’s a non-issue. Correct, but the question then arises when poor immigrants are coming at our expense do we still need to help them? Whats the moral thing and best for America? I would add most of the immigrants while not bad people are only coming because they want to live of govt programs. You see when our ancestors arrived they didn't get any govt help. Today they all get programs . whats more most come for that reason. If I were poor I'd do the same (many jews do it too). Now that we have a welfare / govt program system should we still be letting so many in on the tax payer's dime. can anybody tell me what the Jewish dems in congress did for us yiden? did anybody read the letter before yum kipper from the president? can anybody name me one president that wrought a letter like this? can anybody tell me one good thing obama with his senate and congress did for isreal?